Kids first learn Spanish subject pronouns from context as you use them, especially to contrast what different people are doing. 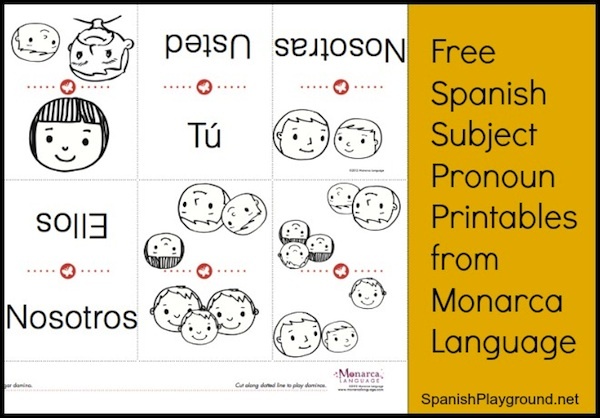 These printable worksheets and domino game from Monarca Language give kids focused practice with the Spanish subject pronouns and the verb ir. It can be useful to provide this practice with Spanish subject pronouns because kids read them and need to associate them with verb forms. Monarca Language offers an extensive selection of printable materials for teaching preschool Spanish. The units are designed for children 2-6 and center around core themes. Learn more about Monarca Language. I think it is hard to represent the subject pronouns clearly on paper, so it is important to add movement and context when you practice them. When you do activities with pictures, be sure kids know which picture represents the person who is speaking, and who is being talked about. Download the printable activities using the link at the end of the post. The free matching activities from Monarca Language have a sentence with the subject pronouns and the verb ir: Voy a la playa, Vas a la playa, etc. Kids match the sentences to pictures. – Act out the sentences using the pictures to make stick puppets. – Role play the sentences. With simple props like sun glasses and a beach towel kids really have fun with this. – Before you play with kids, take a moment and match the pronouns to the pictures yourself. – Look at the pictures and talk about the pronouns. – Be sure kids know which picture is the speaker/speakers and which picture is being talked about. – Kids can make the mouths of the speakers into circles and color the picture they are talking about. Sometimes they are the same. For example, kids will open the mouth and color the face that represents yo. The picture they color will match the pronoun word on the dominoes. – As you play, use the sentences from the matching activity again. For example, when you play a domino with él say Él va a la playa. Download the free Spanish subject pronoun activity and domino game from Monarca Language.